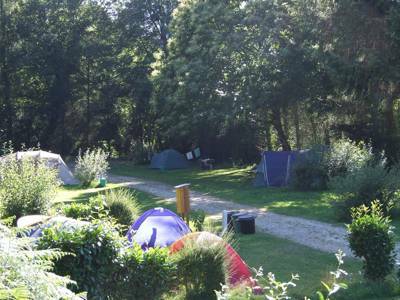 Relax and unwind at Huttopia Douarnenez campsite, on a magnificent, undulating site, ideal for anyone who loves nature and the ocean. The sea, the beach, the waves! On a sunny day in Brittany it’s always the coast that seems to be calling. And, despite the cloak of trees that provides shade and a touch of wilderness to Huttopia Douarnenez campsite, the shimmering blue of the Atlantic is ever present. 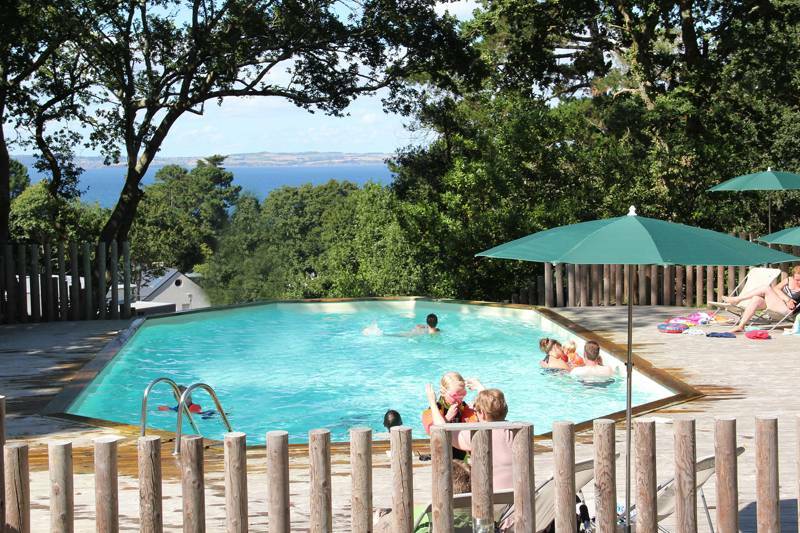 Sometimes you glimpse it glinting through the trees, other times it’s in full view – the on-site café and swimming pool, for example, boast unbroken views all the way across Douarnenez Bay. Wherever you pitch your tent, however, the sea is always just a short stroll away. La plage des Sables Blancs – imaginatively translating as ‘the beach of white sands’ – is just 400 metres down the path. 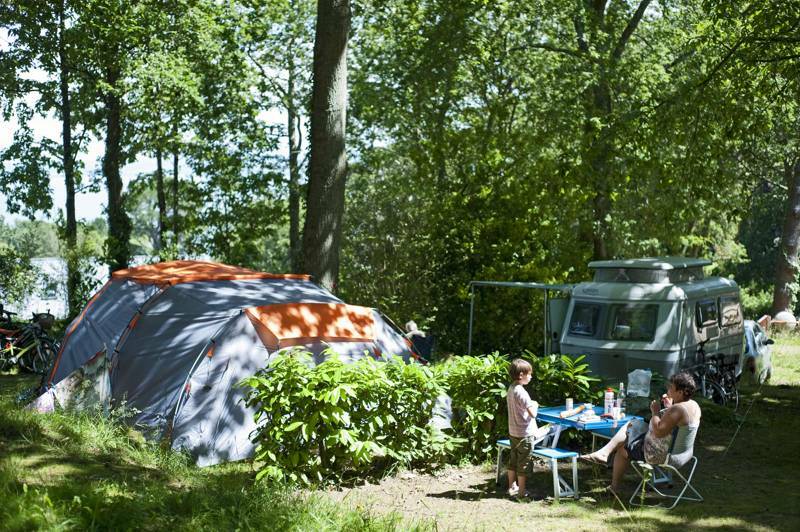 Spread across some 10 acres of light woodland beside the fishing port of Tréboul, 25 kilometres north of Quimper, Huttopia Douarnenez is a family-friendly campsite where tent campers still rule the roost during the busy summer months. Motorhomes and caravans come and go in their number, too, while, in the far corner, near to one of the campsite’s two large, modern washrooms, pre-pitched safari tents and gypsy caravans are available to rent, fitted out with separate rooms, proper beds and all the kit and caboodle you could need. Run by the well-established Huttopia group, facilities are not lacking. Along with the heated swimming pool, there’s a playground, indoor games room and library, free Wi-Fi, a small shop and a bread delivery service. At quieter times of year there’s a self-service tea and coffee area, too. Yet, despite the organised fun of their ‘kids club’ and links with the water sports centre down on the beach, Huttopia Douarnenez still remains refreshingly laid-back and informal compared to Brittany’s big holiday parks. The campsite is wonderfully quiet – there’s no late-night discothèque and big group bookings aren’t permitted – while the rich foliage creates a green and natural feel. From the beach you can hop on to the coastal footpath that wiggles its way around this rocky region of western Brittany. Or, if you fancy saving yourself the 35-kilometre walk, you can drive out to Pointe du Raz and enjoy the views from there, best appreciated on a windy day when waves thrash La Vieille lighthouse that perches on the headland’s outermost rock. Quimper, meanwhile, offers more urban distractions – a clutch of good museums, an excellent art gallery and stacks of fine French restaurants – though, for most, sticking to the surf, sand and seafood around Douarnenez is ample activity enough. Enjoy views of Douarnenez Bay from the terrace and swimming pool... The rugged coastline of the Pointe du Raz and the picturesque towns of Locronan and Quimper are easily reachable. For latest availability and best prices for Huttopia Douarnenez, please use the Date Search above. 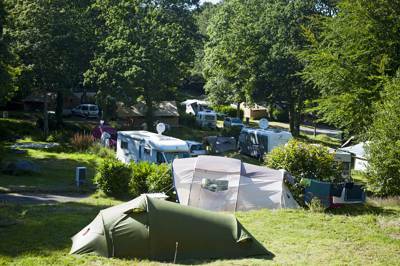 90 camping pitches and 55 glamping units (wood and canvas tents and roulottes). 2 new shower blocks, laundry (coin operated), freezer, motorhome service point, heated swimming pool, playground, table tennis, volley ball court, table football, free Wi-Fi (around reception), TV area and common room with books and games to borrow, self-service tea and coffee during low season and a small grocery shop for any essentials you've forgotten. BBQs and fridges are available for hire – only gas/electrical BBQs are permitted on your pitch; there is a specific area on the campsite for charcoal BBQs. Tourist information in reception and a programme of activities on-site during the school summer holidays. It's a 5-minute walk to the nearest sandy beach – La plage des Sables Blancs – with pedalos and boats available to hire. Walkers, meanwhile, can join the GR34 route nearby or follow the coastal path from beach to beach. There is also a horse riding centre 2½ km away. In Douarnenez, the port museum (0033 2 9892 6520) is surprisingly fascinating and well worth a visit, while, in Quimper, the Cathedrale St-Corentin (0033 2 9853 0405) is a must and the department's main museum, Musee Departemental Breton (0033 2 9895 2160) is also a good find (as is the Musee des Beaux Arts; 0033 2 9895 4520). Start at the tourist office in the town centre, though, to really get your bearings or just visit the tourist office in Douarnenez, which is a 2½ km walk from the campsite. An on-site snack wagon opens all day during July and August (drinks, homemade pizzas, salads, snacks and more) with an outdoor terrace overlooking the sea. You can also take away. Fresh bread and pastries are available to order each day (place your order the evening before) and there's a small grocery shop at reception. Locally, seafood is the thing to aim for. Famous Breton specialities are far, crêpes and galettes, and the famous Kouign Amann of Douarnenez. For the best crêperie, try Au goûter Breton (0033 2 9892 0274) in Douarnenez (3½ km), while, for an excellent fish restaurant Le Bord’eau (0033 2 98 92 60 86) right in the town centre is our top pick. Camping from €13.50–€25.90 per night, including a pitch, 2 people, a vehicle and a tent (or motorhome) or €18–€30.90 if you include electric hook up. Additional adults €4–€5.50; children (4–10yrs) are free in low season and €3.30 in high season. Under-4s are free. Pets €2.40–€4.80. Glamping accommodation begins from €45 per night. From Nantes, follow signs to Vannes, Lorient, Quimper and, finally, Douarnenez, then follow signs to Tréboul where you will begin to see specific 'campings' and 'Camping Huttopia' signs. From Roscoff, it takes around 2 hours; follow signs to Landivisiau, then Châteaulin, then Douarnenez and then as above. The nearest train station is in Quimper (0033 892 35 35 35), 25km away. Buses run from Quimper to Douarnenez.